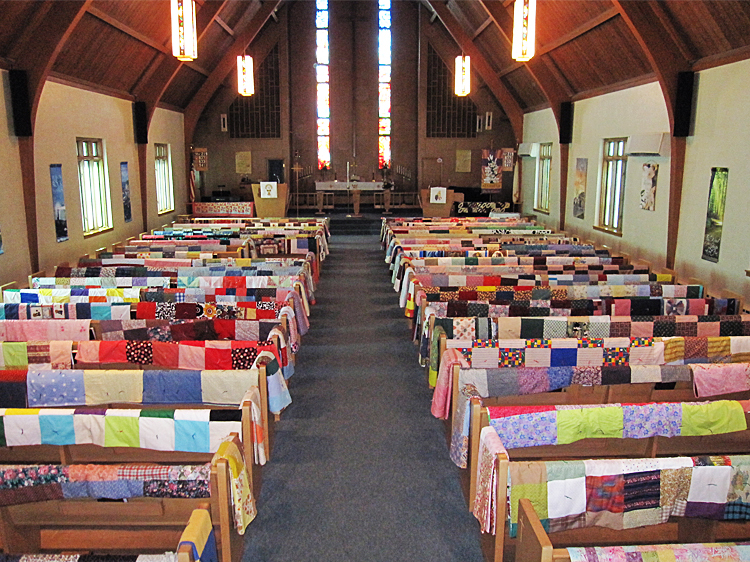 Pilgrim Lutheran Ladies Aid Society is a member of Iowa District West, Lutheran Women’s Missionary League, Sac City Zone. Zone members rotate hosting the Spring and Fall Rallies. We meet the first Wednesday of each month, except January, in the church fellowship hall. Any lady belonging to the congregation may join the society. Women who are not communicant members of the church may be enrolled as non-voting associate members. Guests are always welcome. We have Prayer Partners that change each year, and one does not have to be a member of the society to be a prayer partner. At our monthly meetings, we have devotions, a lesson or topic, business meeting, the birthday song for members having birthdays that month, closing prayer, and lunch. In July, we meet for a morning meeting and sing-along. In December, we host a Christmas luncheon and party for members and guests. Cover Girls finished 162 quilts, with 135 being sent to Lutheran World Relief, 3 donated to the Camp Okoboji Quilt Auction, 4 gifted to our high school graduates, 14 sold, and 6 saved for future donations. Our other mission projects were assembling 40 School Kits and 12 Dress Kits and collecting 66# of soap for LWR. We also made pillow case dresses and Witness bracelets for the IOWAY project. February 1st we held the birthday party at Shady Oaks Care Center, playing Bingo with the residents. March 27th we hosted the Lenten Luncheon. In April we held the LWML Prayer Service. September 19th we hosted the LWML Fall Rally. Ameeting was canceled due to bad weather. In March, we held the LWML Prayer Service. March 14th, we hosted the Lenten Luncheon June 1st we met at Sweet Things for a breakfast meeting. Meridith Sperling served as delegate to the IWD LWML Comvention June 23 – 25, and also helped y. At our December meeting, a motion was passed to give $600 to variou mission projects. We have 20 active members and 1 honorary member. Six members had perfect attendance during 2017.